With a maximum throughput of 6,889 ft²/hour equating to 128 5’ x 10’ beds/hour, Onset X2 is ideal for companies producing fast-turnaround retail graphics. As the business expands, Onset X2 provides the capacity to extend the range of jobs companies can handle. 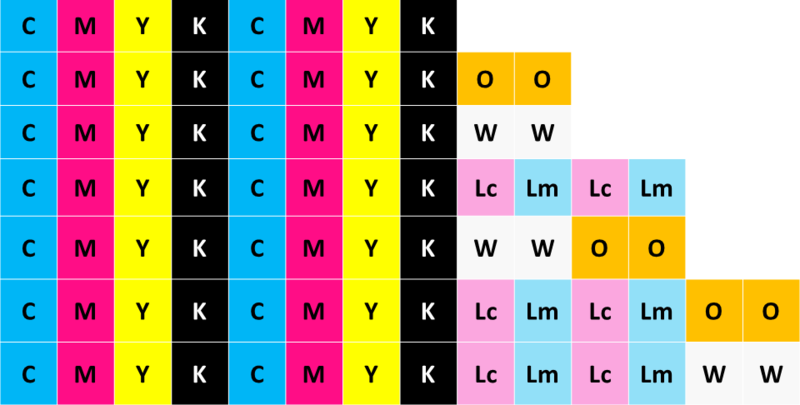 The addition of a second set of CMYK delivers even higher productivity while an optional six LmLcWO channels can be populated to add versatility and superb quality. A choice of unidirectional, bi-directional and super high-quality print modes can be selected depending on the specific job requirements. Using Fujifilm Dimatix drop-on-demand printheads with a native 14 picoliter drop size, innovative Tier Drop technology allows 11 – 14 – 17 picoliter options to meet changing speed and quality needs. 25 Zone ‘No Masking’ Vacuum Bed – Featuring a powerful new vacuum system and choice of table skin design, the need for bed masking is eliminated, whatever the substrate size, and greatly reduces set-up times for the most common POP substrates and increases throughput of short-run, fast-turnaround print. Vacuum zones are independently controlled and the auto zone function allows it to be easily managed by the operator. Simple User Interface – Touch screen GUI makes it easy to finalize and initiate jobs, save settings, create print queues and manage and optimize every stage of the print process. Improved off-machine job set-up means jobs arrive at the printer with more predefined parameters – substrates, print speed, quality mode, gloss level, etc – already specified. Inca Software Suite – Provides operators with a complete suite of productivity-enhancing software including Reporter Pro, Inca Vision and Print Run Control (PRC). Choice of Automation Systems – Increase the throughput of the Onset X2 by reducing manual change out of materials with the optional 3/4 Automation system or fully-automated feed system. Caldera Grand RIP + (Fujifilm edition): Support for over 800 printers and cutters. Analyze cost on each job printed. Helps designers make corporate spot colors with new Color Book. ColorGATE Production Server (Fujifilm edition): One RIP solution, offering support for over 750 printers and cutters. Sync color between multiple printers with easy 3-step process. Inca Vision remote diagnostics software is like OnStar service for ink on press. Your Onset X support team can monitor your press remotely and be automatically notified if any performance degradation occurs. Ensures maximum productivity and press uptime.